Back at the beginning of November, my friend Sara and her girls came from Little Rock for a visit. Chris, Sara and their girls moved to Arkansas back in the summer and we have missed them so much since then! 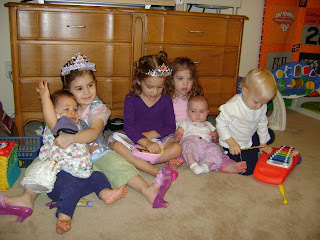 Several friends dropped by that day so they could visit with Sara and the girls. 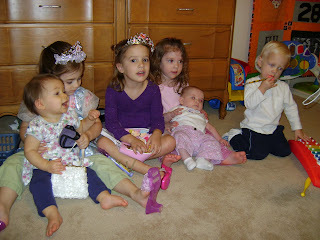 Back when Avery and Chloe were a little over a year old and Kate was just a baby, Christy, Sara and I got together every Thursday so the girls could play and more importantly so the mommies could visit and get out of the house! I miss that old playgroup!! Here are a couple of pictures of the "old gang," each with a new sibling. I am very behind on blog reading and my own blog - just saw this. So cute! We miss you guys so much - today was kind of one of those days where I could have stood to be somewhere other than Little Rock alone! - sigh!